Golly, I seem to have missed two whole Tuesdays in a row! Terribly sorry. In my defense, it was prep week, then first week of classes, plus gearing up for… (tada!) 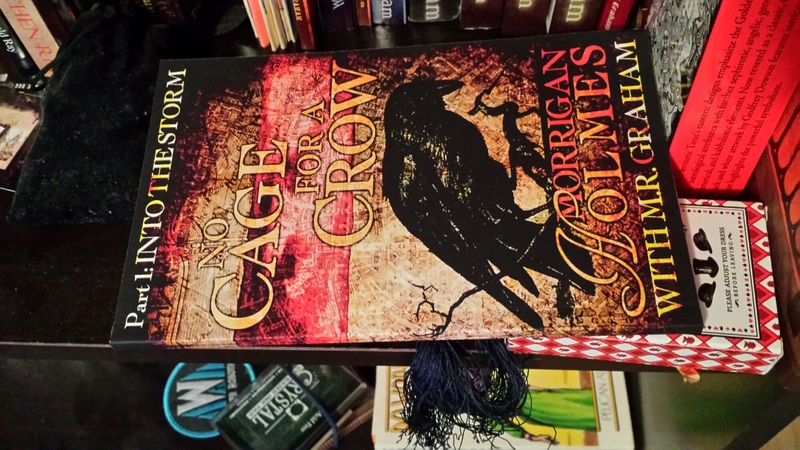 the release of Part 1 of No Cage for a Crow! Why, yes, it’s out, now. So I guess I better get my act together and start teasing again. Here goes. Every Tuesday (in theory), I post a teaser for one of my current works in progress. I invite all of my writer buddies to join in! Surprised? Well, it’s not done, yet, so I get to consider it still “in progress”! Anyway, this isn’t so much a “teaser” as useful information. Click that link above. Go ahead, click it. Notice anything? Such as a distinct dearth of paper options? Well… yes. And no. There is a paperback. It exists. It is sitting on my shelf right now. But here’s the kicker: You can only get it from me. (Bwahahahaha.) Not from Amazon, not from Barnes & Noble, not from arcane rites. (Prove me wrong on that last one.) You can get it from me through giveaways (typically through Goodreads), or in person at conventions and events, or here on the website. It’ll be appearing soon under my Shop tab up there, but if you need a copy right now, you can hit the Contact button, and I’m sure we can work something out through Paypal. The result is that every copy in existence will be signed. By both authors. Nifty, eh?